It is that time of the year again, the time when my family feels like taking on some type of DIY project that everyone of us has to get involved in. So what are we up to you ask? 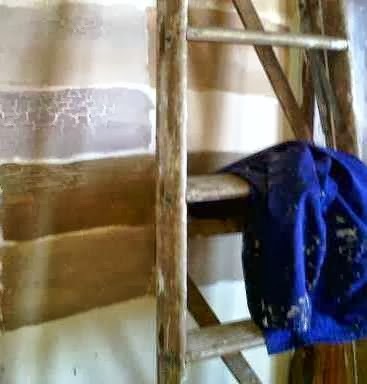 We are painting the inside of the entire house. That sounds easy you might say, but I am afraid of heights and our ceilings are very high, so any ladder work is out for me. But I still do my bit. Right now my hands are covered with speckles of paint of various colours and I am awaiting my siblings arrival from work so that it can all start again. I have also decided to work on my writing resume. I am trying hard to come up with some good short story or even flash fiction ideas. Perhaps I need to start small first, before seeking publication for my novel. Who knows, maybe I can better my writing in the process. Oh dear. I use to hate the DIY's one year we painted the house ORANGE. Not a subtle or a burnt orange, it was pumpkin orange. My mom loved the color. I hope your project turns out perfectly, Murees. I can imagine what a big undertaking it is. It seems to me that those things are always a little different than what you expect, but I'm not experienced at that sort of thing at all. I hope your writing surprises you as well. We'll look forward to hearing more about it. Jai - Thank you. We have two different shades of purple and one terracotta. I guess we will see what the end result will be like. At least your mom liked your colour. Deanie - Thank you. So far things are taking a bit longer, but we like the colour. I am really excited to start and build up my writing resume. It will definitely come in handy. Good luck with the DIY's and with building your resume. Hi Murees - sometimes it's good to work and think .. creativity arises. Gosh painting the whole house - good for you ..
Hilary - Thank you. It was definitely very hard work.